The Feile year for many is the most important year at Juvenile level. The chance to represent not alone your club, but your county at the Tournament ranks high among the reason’s for its priority. Anther key reason for its importance is the Inter-County Tony Forristal Tournament held each year on the last weekend in August in Waterford. The future stars of the Déise are all on display against top opposition in Kilkenny, Tipperary, Galway and Cork. 2015 was a special year for our Under 14’s , having gotten to the Feile final which we narrowly lost out to a strong Brickeys side we went on to represent our club with pride in the Feile in Donegal. 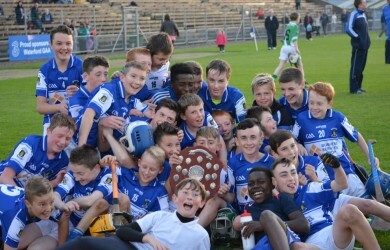 Having returned we reached the Feile County final and they finished off a long year in style winning both the Eastern and County Championships in the space of five days, first off they faced Clonea in Walsh Park, the lads got off to a flying start and went into the break with a commanding 3-07 to 0-03 lead, in the second half they scored six more points to finish out the game on a scoreline of 3-13 to 1-04 leading to great celebrations at the final whistle, it was back to the same venue on Saturday as they took on Brickey Rangers in the County Final. Contact Pat for training times.